“Nephthys is the hidden or veiled one who serves as a medium between the worlds. She comes to us in dreams, flashes of intuition, and visions. Along with Isis and Nekhbet-Mother-Mut, Nephthys is an aspect of the Triple Goddess. She relies upon spirit to direct her in all things and she holds the mystery teachings of life, death, and rebirth deep within her essence. The mother of Anubis, Nephthys is also the true Virgin, or the woman unto herself, in her manifestation as the High Priestess. 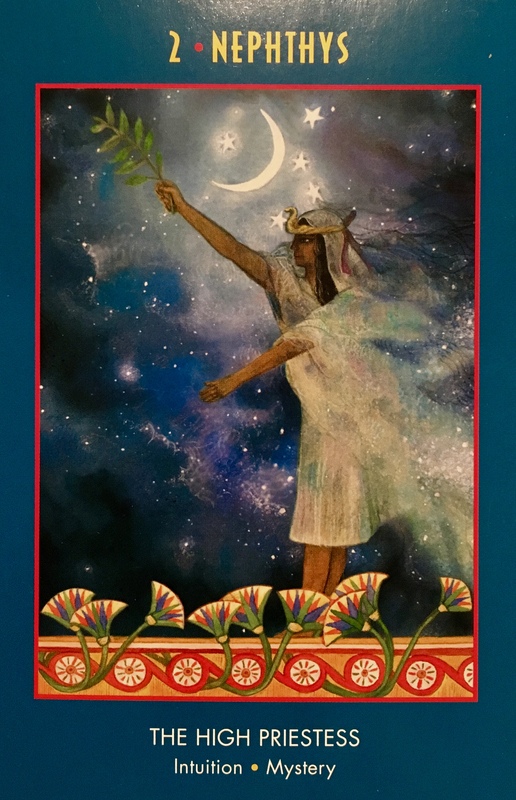 In our shamanic visionary experience, she inspires the seeker as she whispers her secrets into the wind and dances exotically under the starry sky with magnificent serpents winding around her beautiful bronze arms. Although she is less renowned than her twin sister, Isis, they are seen together on the walls of the temples and at either end of every sarcophagus in ancient Egypt. When Osiris’s body was scattered throughout Egypt, it was Nephthys and Anubis who helped Isis find and gather the parts to make him whole again. When Nephthys appears, she is working with your third eye and your sense of intuition, which will guide you further into the mysteries and to that which is hidden in your subconscious mind. She helps you to see in the dark. If you have drawn this card, be especially attentive or watchful for synchronicities. (What you may normally think of as a coincidence is actually the universe trying to gain your attention.) Pay attention to those sudden “hits” of inner knowing and guidance, and watch for those outer events or experiences that form synchronistic parallels to the inner messages you are receiving. A very auspicious way to start off your Spiritual Quest… with the guidance and assistance of Nephthys. She will prepare you, body, mind and spirit for the journey you are about to embark on. She will activate your Third Eye chakra, she will open your Heart and your Higher Heart Chakras. She will heal you as she opens you up to the mysteries of the Universe. She will bring you people and opportunities that will assist you on your way. There are no coincidences, know that any and all synchronicity in your life right now is no mistake. Nephthys is drawing you forward. She is helping you to remember why you came here, and who you really are.